Food supplements must not replace a varied and balanced diet and a healthy lifestyle. As with other food supplements, consult your doctor or pharmacist before using if you are under medical supervision, pregnant, breast-feeding, have epilepsy, a thyroid condition, haemochromatosis, suffer from food allergies, or are allergic to any of the ingredients. Made in a site that may handle nuts. Not suitable for children. Allergy Advice: For allergens, see ingredients in bold. This product contains iron, which if taken in excess, may be harmful to very young children. This product will not affect the lens prescription required in long and shortsightedness and astigmatism. Store below 25°C in a dry place, out of sight and reach of children. Why has Visionace been developed? Can Visionace help with conditions such as Glaucoma and 'Floaters'? Can Visionace be used simultaneously with medications? Will Visionace have any effect on lens prescriptions required in long and short sightedness and astigmatism? How many tablets does one pack of Visionace contain? How and when should Visionace be used? Are there any undesired effects whilst taking Visionace? Is Visionace suitable for vegetarians? Visionace is a comprehensive, researched based nutritional combination which contributes to the maintenance of normal vision. It has been tested over several years by a University Department of Vision Science. Visionace is recommended by leading optometrists and eye care specialists in the UK. Visionace contains a spectrum of nutrients including Betacarotene, Zeaxanthin, Lutein, vitamin C and citrus bioflavonoids. Visionace is recommended for those who wish to help maintain normal vision. It is ideal for contact lens wearers, or those working long hours at a computer screen. No. Visionace is a food supplement formulated with specific nutrients to help contribute to the maintenance of normal vision. It will have no direct benefit on conditions such as glaucoma and floaters. Specific nutrients in the formula, such as vitamins B2 and C, contribute to the normal functioning of the nervous system. Vitamin E, copper, manganese, selenium and zinc contribute to the protection of cells from oxidative stress. Generally, Visionace may be used alongside medication as it contains only moderate levels of vitamins and minerals and is free from drugs or hormones. For specific advice on taking Visionace with medicine please contact your doctor or pharmacist. No, Visionace will not have any effect. 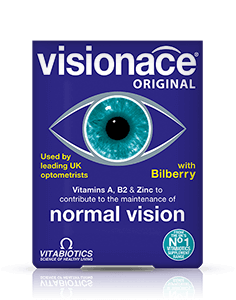 Visionace contains 30 one-a-day tablets per pack. One tablet per day is recommended, with or immediately after your main meal, with water or a cold drink. Taking the tablet with a large meal maximises the absorption of the nutrients and can reduce nausea, which is sometimes experienced if multivitamins are taken on an empty stomach. Visionace should only be taken on a full stomach. Always ensure that Visionace is taken with plenty of cold liquid to wash the tablet down, not tea or coffee as this may cause the tablet to disintegrate too early. Visionace has no known side-effects when taken as directed. Do not exceed the recommended tablet intake. In case of overdose, seek medical advice immediately. Yes, Visionace is suitable for vegetarians. Results vary amongst individuals but in most cases, we would expect the beneficial effects of the vitamins and minerals in Visionace to build over several weeks, with noticeable results in one to three months. There is no maximum length of time over which Visionace may be used, however, a regular intake is recommended.